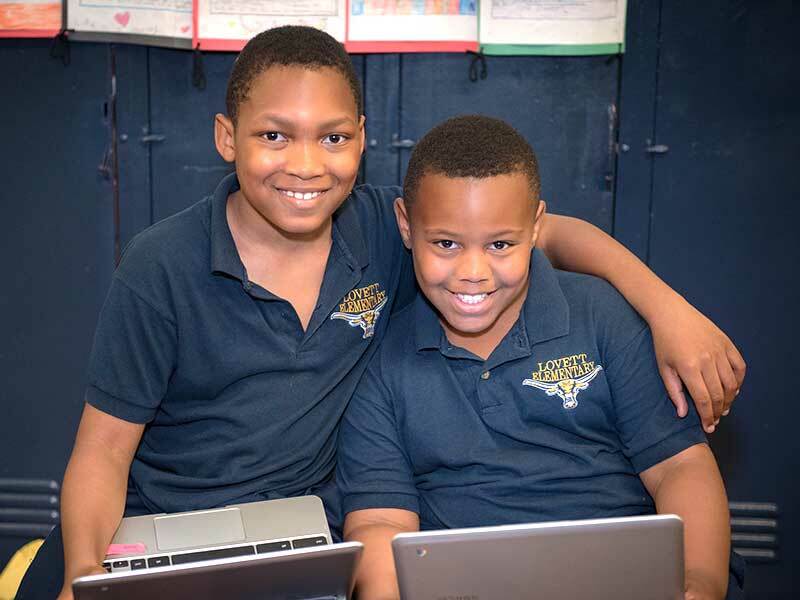 Lovett operates in a full inclusion model for its diverse learners (those who have an Individualized Education Plan or “IEP”). All students are fully integrated into the general education classrooms, and no diverse learners are pulled out of the general education classroom for special instruction. Recognizing that nearly all of their students have unique learning needs, regardless of IEP status, Lovett tries to incorporate as many adults in the classroom as possible, including those who might traditionally serve diverse learners. This includes the general education teacher, diverse learner teacher, aides, and student teachers from University of Illinois at Chicago. Given that Lovett operates within a blended rotation model, these adults can all help promote learning in different ways (facilitating small groups, prompting independent work, etc. ), allowing special attention to be paid to those that need it. Not only does this approach better meet the needs of all students, but it also reduces the stigma around diverse learning as students recognize that everyone sometimes needs special help. Diverse learners have an Individualized Education Plan and may receive modified instruction based on that plan. Students are grouped based on instructional need, so a group may contain a mix of students with and without IEPs (students do not know who has one and who doesn’t). Diverse learning teachers support four or five classrooms. Diverse learning teachers create a weekly schedule to ensure all of his or her students are getting the support they need (based on their Individualized Education Plan). Diverse learner and general education teachers coordinate during weekly planning sessions to figure out the best time for diverse learner teachers to be in the classroom. Diverse learner teachers work in classrooms addressing students with the lowest skill levels during core content blocks when students are grouped based on abilities. This practice often enables them to reach all of their students in a single classroom. All teachers modify content and instruction based on individual student needs. Provides data via online programs on student progress for individual skills, helping to identify student needs. Provides NWEA data to help teachers understand which students need the most support in certain skill areas.